Nowadays, nobody would deny the importance of the network. It has become an inseparable part of our daily life. As it developed, people’s demand for bandwidth is increasing. And 10G network is widely applied in small and middle sized business. In addition, 10G home network can be also commonly found. This article will share some tips to set up 10G home network. Why do you need 10G network? It is not difficult to find that almost everything nowadays rely on a fast and reliable network, which leads to tremendous traffic and applications running on the network. It is necessary to upgrade your home network to support the growing of your business. Setting up 10G home network avoids network congestion at busy times while improves your productivity. What do you want from 10G home network? Before you start to set up the network, better planning is needed. You should ask yourself a few questions, such as how many computers, printers and other peripherals will connect to your network? How much wireless coverage will you need at your location? What type of mobile devices will need access to your network? To build a 10G home network, several components are required: 10G core switch, access switch with 10G uplink, and 10G network interface cards for servers and storage devices. The past few years had witness the price dropping of 10G network switch. For example, the cost of Ubiquiti Unifi and Edgeswitch switch are only $200. You can also find many 10G switch under $550, such as FS.COM 10G network switch S3800-48T4S only costs $480 by offering 48 100/1000Base-T and 4 10GE SFP+ ports. There are two cabling ways for 10G home network—10GBASE-T and 10G SFP+. If you choose 10GBASE-T, then upgrading the existing 1G network to 10G can be simple. If 10G switch is designed with RJ45 ports, you can use the same RJ45 network cable to connect the 10G switch with your server, storage and some other switches. The only difference is to use Cat6a network cable instead of Cat5e and Cat6 cable, because Cat6a can support 10G data rate over 100 meters; or you can choose SFP+ 10GBASE-T module with 2.5W power consumption and a maximum distance of 30 meters. For 10G network switch that supports 10G SFP+, you can use it with devices that come with 10G SFP+ ports, too. For server or storage devices with 10G SFP+ port, the most cost efficient way to connect them with 10G network switch is to use 10G DAC cable (direct attach cable). It is basically copper cable with SFP+ connector on both sides. But this cabling way is only suitable for short connectivity. For data link over 100 meters, a pair of SFP+ modules and the matching fiber optic cable are needed. Depending on the length required in home network, you can use 10G optics such as 10GBASE SR SFP module and multimode fiber to reach 300 meters. For home network set up, 10G is a trend. But before you migrate your network to 10G, you still have to think about what you want or what you need. After that, the choice for components and cabling procedure can be easy. FS.COM provides comprehensive 10G solutions: all the components mentioned to build a 10G home network are available at FS.COM, including 10G switches, network cables, 10G SFP+ transceivers, fiber patch cables and DAC cables. We know that fiber optic cable and transceiver are important components to complete the whole optical link. In addition, there is another core component in data center—switch, which is the nerve center of the whole network deployment. This article will introduce two Cisco switches—Cisco Nexus 7010 switch and Cisco Nexus 7710 switch, and make comparison between them. Characterized by high availability and scalability, comprehensive Cisco NX-OS Software data center switching feature set, Cisco Nexus 7010 switch and Nexus 7710 switch are designed to satisfy the demand for high switching capacity in data centers. As Cisco Nexus 7700 Series switches are the latest extension to the Cisco Nexus 7000 Series switches, there are similarities and differences between Cisco Nexus 7010 switch and Nexus 7710 switch. How much do you know about them? Keep reading and you will find the answer. The following figures show Cisco Nexus 7010 switch and Cisco Nexus 7710 switch. From the above figures we can have a basic knowledge of Cisco Nexus 7010 switch and Cisco Nexus 7710 switch. And the following part will focus on the similarities and differences between them. Both of them are 10-slot chassis switch with 2 dedicated supervisor modules and 8 I/O modules. Both of them are structured with 384 x 1 and 10 Gigabit Ethernet ports. Both of them utilize front-to-back airflow which can ensure that switch addresses the requirement for hot-aisle and cold-aisle deployments to help provide efficient cooling. Both of their I/O modules and supervisor modules are accessible from the front, and fabric modules and fan trays are accessible from the back of the chassis. Both of their fan trays are composed of independent variable-speed fans which can automatically adjust to the ambient temperature, and this helps reduce power consumption in well-managed facilities while enables optimum operation of the switch. Both of their systems not only allow hot swapping without affecting the system, but also support air filter to promote clean airflow through the system. Cisco Nexus 7010 switch has 48 x 40 Gigabit Ethernet ports, and 16 x 100 Gigabit Ethernet ports. While Cisco Nexus 7710 switch has 192 x 40 Gigabit Ethernet ports, and 96 x 100 Gigabit Ethernet ports. Cisco Nexus 7010 switch has 5 fabric module slots and 3 power supply slots. 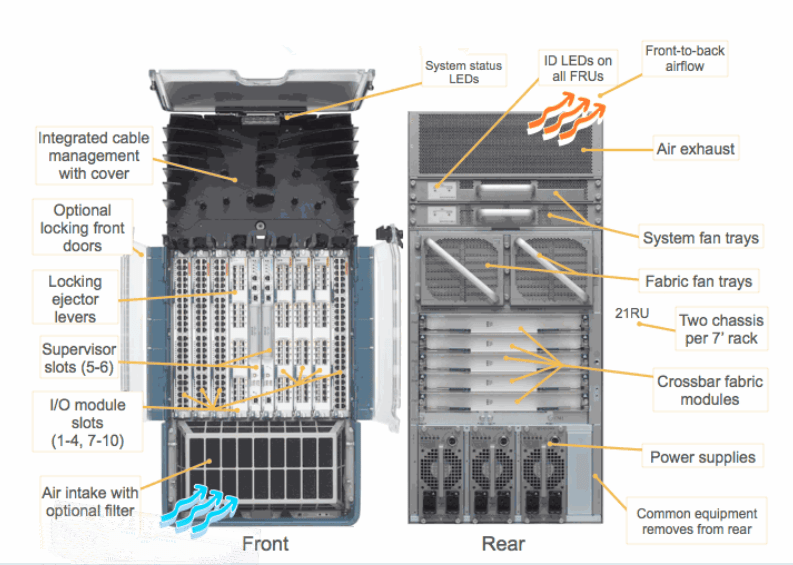 While Cisco Nexus 7710 switch has 6 fabric module slots and 8 power supply slots. Cisco Nexus 7010 switch supports Fabric—1 and Fabric—2 modules while Cisco Nexus 7710 switch supports only Fabric—2 modules. Cisco Nexus 7010 switch is designed with 21RU height, bigger than Cisco Nexus 7710 switch’s 14RU height. 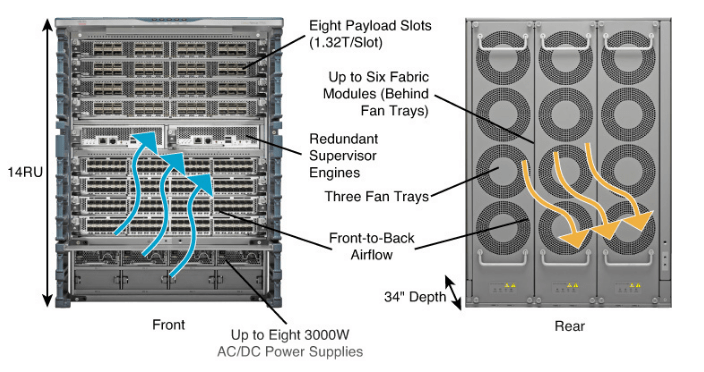 Cisco Nexus 7010 switch uses dual system and fabric fan trays for cooling. While Cisco Nexus 7710 switch uses three redundant fan trays for cooling. The maximum inter-slot switching capacity with the Cisco Nexus 7010 switch is 550 Gbps while Cisco Nexus 7710 switch can achieve the maximum inter-slot switching capacity of 1.2 Tbps. Cisco Nexus 7010 switchsupports F1, F2 and F2e line cards while Cisco Nexus 7710 switch supports F2e and F3 line cards. Cisco Nexus 7010 switchsupports SUP1, SUP2 and SUP2E supervisors while Cisco Nexus 7710 switch supports only SUP2E supervisor engines. Cisco N7K-C7010-FAN-Sis US $1,100.00 on eBay while Cisco N77-C7710-FAN is US $1,299.99. Both Cisco Nexus 7010 switch and Cisco Nexus 7710 switch are designed to meet the scalability requirements of the largest cloud environments. As for which one to choose, it all depends on your individual requirements. If you need higher switching capacity and smaller size, you can choose Cisco Nexus 7710 switch; if your budget is tight, Cisco Nexus 7010 switch is a good option; if you want your switch to support F1 line card and SUP1 supervisor engineer, you have to buy Cisco Nexus 7010 switch. FS.COM provides large stock single mode fiber patch cables and multimode fiber patch cables. Also, they have various types of Cisco compatible transceiver modules for Cisco switch.